The contract was for the design of the submarines for the Australian Navy over proposals submitted by Japan and Germany’s ThyssenKrupp. But the protracted negotiations over the final contract were fractious and even cast doubt over the deal in 2018 due to cost blowouts and production delays. 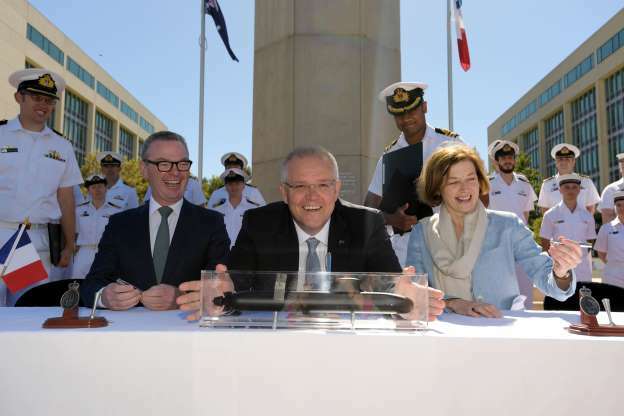 On Monday, Prime Minister, Scott Morrison and Defence Minister, Christopher Pyne met with French Armed Service Minister, Florence Parly in Canberra and signed the agreement to build the “regionally superior’ Attack class submarines. Among other issues, the agreement governs the warranty lifespans and ownership of intellectual property. “This means we are ensuring we are at the front of the pack when it comes to the latest naval vessels and firepower,” Morrison said. The Australian submarines would be a variant of Naval Group’s non-nuclear Shortfin Barracuda with pump-jet propulsion. This is quieter than conventional propellers and has more capabilities to stay underwater for longer periods and travel at greater distances.